Connecticut operates on a two year budget and makes adjustments in the budget’s second year. Currently, the General Assembly is addressing itself to the second year of Governor Malloy’s’ second biennial budget. 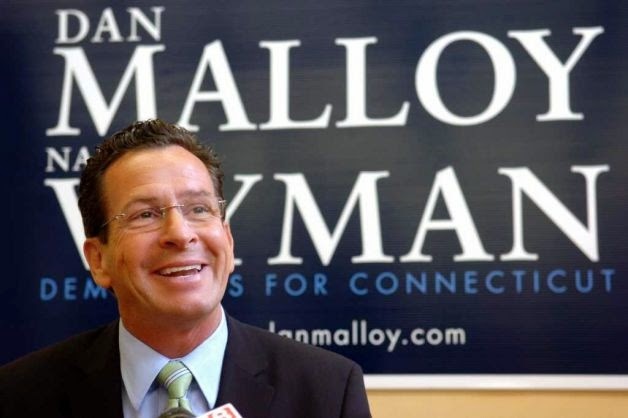 During his years in office, Mr. Malloy and dominant Democrats in the legislature have never produced an appropriation and spending plan that bears Republican fingerprints. Republicans viewed Mr. Malloy’s budget as a political document because, to say the truth, all budgets are political documents. Prior to passage, senate Republican leader John McKinney, running this year for governor, pointed to a “frightening lack of detail” in the single most important piece of legislation the General Assembly has considered in the new fiscal year. The Malloy budget plan will shape the destiny of the state for the next two years. Mr. Malloy, it will be recalled, also shooed Republicans out of the room when he was assembling his first budget. Democratic leaders in the General Assembly pre-approved Mr. Malloy’s first budget. Mr. Malloy then negotiated contractual terms favorable to SEBAC, a state union coalition called by some Connecticut’s fourth branch of government, and the final product, altered in protracted negotiations, did not return to the General Assembly for approval before being signed into law by the governor. The Democrat dominated General Assembly, abrogating its constitutional obligation to vote on a substantially altered budget, had invested the first Democratic governor since William O’Neill declined to run for re-election with near plenipotentiary powers, an investiture of powers not uncommon in other one party states. The back-room budget negotiations, conducted entirely in private, ought to have alerted members of Connecticut’s left of center media that neither public notice nor bi-party participation is necessary in a one party state. The Malloy administration has become the most secretive back-room directed government in living memory. But then, everybody knows that all one party governments do this sort of thing with impunity: The one party state gets away with tucking dead bodies under the rug because there is no political antagonist in the room to report the attempted concealment. This time around, the best laid plans of Malloy and company were torn asunder by a collapsing private marketplace. Although the national recession ended in 2009, here in Connecticut, following the largest tax increase in state history, the malaise marches on. While the nation has gained back about three quarters of the jobs lost during the last recession, Connecticut has recovered only half. Noting that Connecticut “lost its chief marketing tool” with the imposition of the income tax in 1991, a recent University of Connecticut study, “The Connecticut Economy,” recommends the elimination of the state’s corporate income tax. When a tax is reduced in Connecticut, it is generally supposed by all tax consumers that the hole punched in the budget by tax reductions cannot be backfilled with spending cuts. Ergo: taxes may NEVER be cut. Connecticut’s collapsing budget is heavily reliant on taxes reaped from financial institutions, and progressives in the state, perpetually on the hunt for new tax resources to plunder so they might fund improvident spending, would like nothing better than to take a larger tax piece out of the hides of precisely those financial firms that have been holding the state’s head above water during President Barack Obama protracted recession. So far, Mr. Malloy has been able to repulse attacks from wild-eyed progressives at the gates while schmoozing with public sector union chiefs. In a post-election Malloy administration, the governor will “have more flexibility” to reconsider his often repeated pledges not to raise taxes. The governor has not pledged to decrease spending, a kiss of death pledge in any pre-election campaign. At least one newspaper, the New London Day, has warned us that Connecticut’s current spending level is unsustainable. But Mr. Malloy, media Malloyalists, progressive big spenders, Democratic leaders in the Democratic dominated General Assembly, fourth branch of government union leaders, municipal leaders dependent on state grants – none of these special interests are interested in lopping, say, $1.5 billion from the state budget, a figure that just might catch the eye of in-state businesses looking for the exit signs. Ergo: Taxes will rise; regulations will increase; business activity will decrease; the population of Connecticut, the only state in the union to have lost population, will decrease; prices, including the price of education in Connecticut, will increase; and the state will continue its downward trajectory until it reaches bottom, at which time it may be possible to hope for a sweeping change in government. But hope is no surety of success. Progressive one party states such as Venezuela, once known as the Paris of Latin America, reached bottom long ago, and Connecticut, blessed by geographical determinants, a once healthy two party system and a shared understanding that state spending is no guarantee of prosperity, appears to have adopted the Hugo Chavez’s leadership model, along with his sound and fury rhetoric. It used to be said of God – when politicians yet believed in God – that He must love the poor, having made so many of them. The same may be said of most one party progressive states. Connecticut will be no exception. One would hope that an opposition party and its candidates would make clear that the State's government has a critical spending problem. I'm not at all sure that a specific promise to cut spending would be a political loser. Certainly, Foley didn't lose in 2010 because of his promise to hold "discretionary" spending steady for two years. I expect with a surplus of Nutmeg moonbat voters Connecticut's electorate is not as opposed to Obamacare as the electorate in a sane State, but I don't see many people of any stripe really jumping for joy about it. Would it not be appropriate for a candidate for Governor to point out that Dannel Malloy's buying into Obamacare has caused Ct. medicaid enrollment to double? If a candidate is afraid to propose actual cuts in spending, he should be able to muster the courage to complain about massive spending increases.